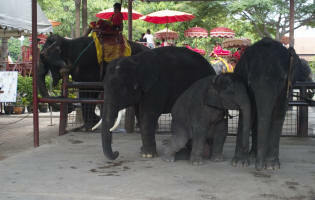 We were up early for breakfast. 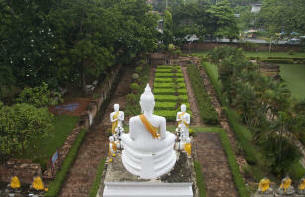 The rain had left a hot, muggy morning. 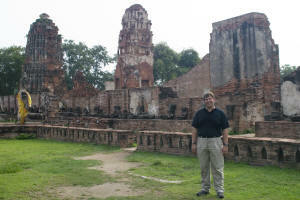 Chet, our guide, met us at 7am. 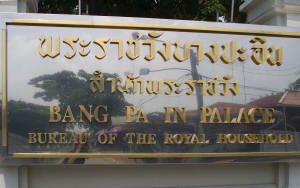 We checked out of the Peninsula, deposited our luggage with Chet and crossed the river to the Shangri-La Hotel where our boat departed for Bang Pa In. 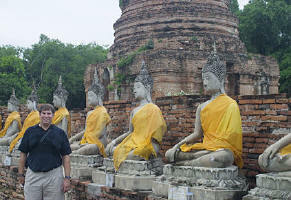 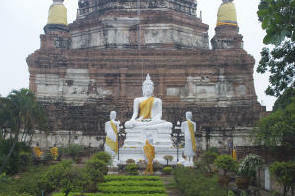 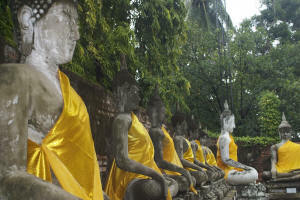 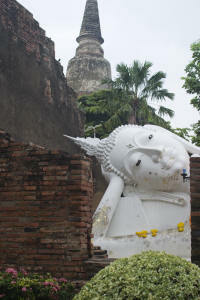 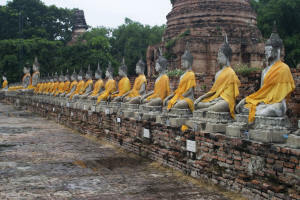 Our ultimate destination today is Ayutthaya. 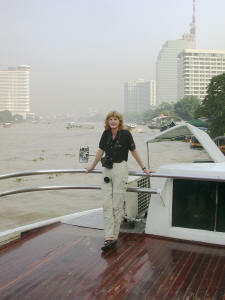 The boat trip was approximately 4 hours up river. 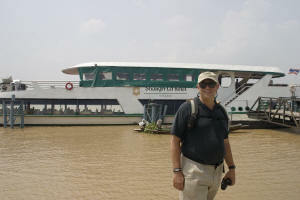 We were the deadhead part of the trip since most tourists go by bus north and then return by river as a dinner cruise. 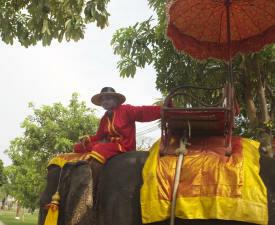 Besides ourselves, two Japanese young women were the only passengers this morning. 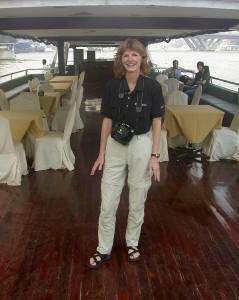 We would enjoy the luxury of having the boat to ourselves for tea and the lunch buffet (destined for the dinner buffet, later that afternoon). 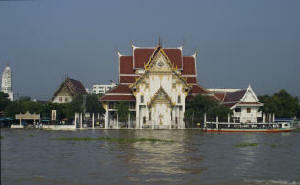 Many temples, both old and new, are situated along the river. 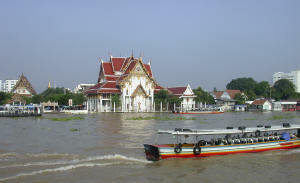 As we moved from the city to the more rural areas, we noted a number of military complexes and government buildings including the Ministry of Commerce situated along the river. 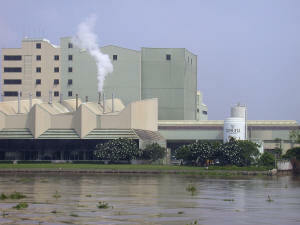 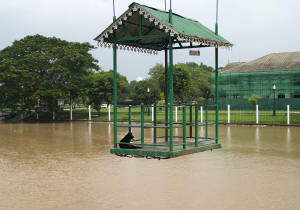 The river provides the means for the movement of goods in commerce, access to water for manufacturing and transportation and large sites for businesses like Singha Beer and Pepsi Cola. 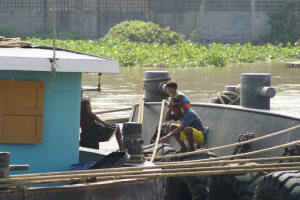 The river also provides housing along its banks and access to water for washing, cooking and travel. 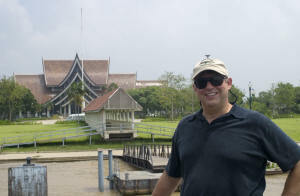 After finishing lunch, we arrive at Bang Pa-In where we are met by Chet and our driver at the dock of the recently completed Queen's handicraft educational complex, Bang Sai Folk Arts and Craft Center. 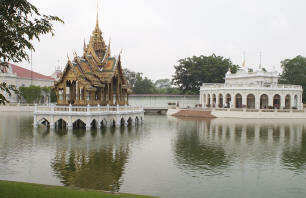 The buildings house teaching facilities as well as marketing and sales offices for craftspeople throughout Thailand. 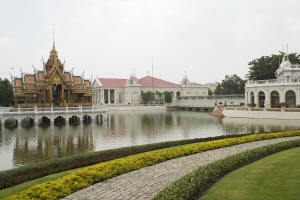 After a short 20 minute drive, we arrive at King Rama IV and V's summer palace. 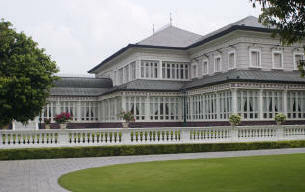 It was King Rama V's interest in European architecture that led to the design of several of the buildings on the grounds. 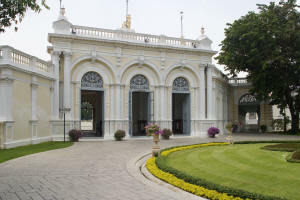 The Palace designed in the Italian Renaissance style serves as a place for state receptions today. 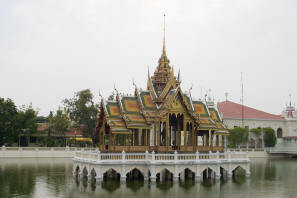 The Aisawan Thippaya is a beautiful Thai pavilion built in 1876 and modeled on the Phra Thinang Aphon Phimok Prasat in the Grand Place in Bangkok. 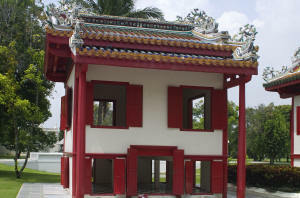 The pavilion is often dismantled and shipped to represent the country at world expositions. 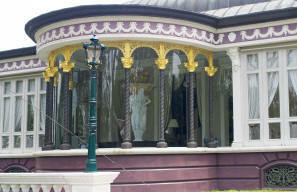 The circular building to the right of the pavilion in Russian style is the reception hall. 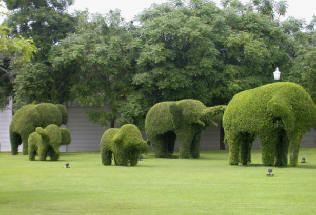 Nearby is the elephant feeding area illustrated by the topiary display. 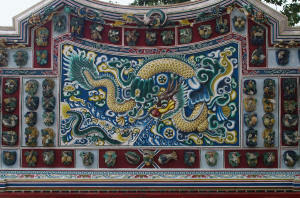 A gift from the Chinese is the Peking Palace containing a collection of jade and Ming porcelain. 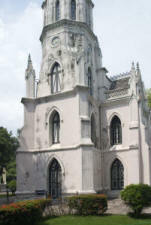 The Royal Observatory built in 17C in a Portuguese-style was used by King Mongkut, extremely interested in observing the heavens. 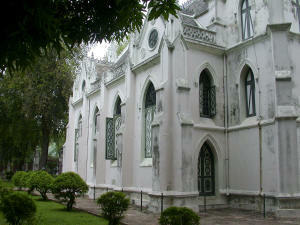 A cable car across the river takes us to Wat Nivet Thamaprawat, built in a Gothic style. 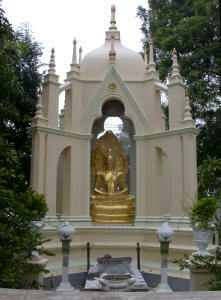 It looks like a Christian church- however, it is really a Buddhist temple. 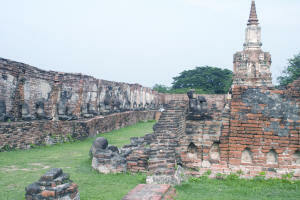 We drove on to Ayutthaya, originally founded in 1351 by King U-Thong and located at the intersection of the Chao Phraya River, Pa Sak River and the Lopburi River. 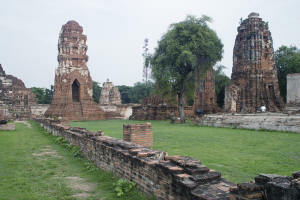 The town became the seat of power in 1350 of the kingdom and then grew to become one of the most beautiful capital cities in the world, controlling trade routes in the region from 16-17C. 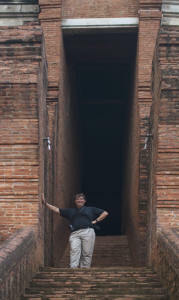 It was conquered several times by the Burmese until 1767 when the Burmese conquered the city and left it in ruins. 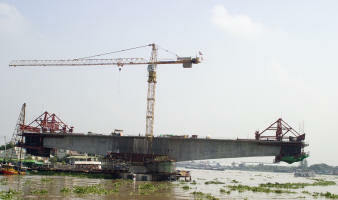 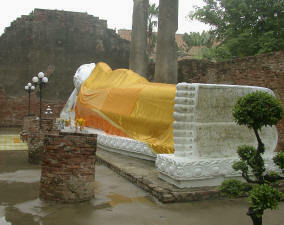 Late 18C, the Burmese were routed out and a new capital was formed at Thonburi. 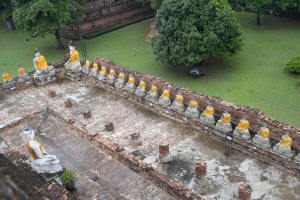 King Rama I removed materials and artifacts from Ayutthaya when he ascended the throne in Bangkok. 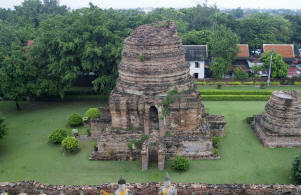 Now the town is on the UNESCO World Heritage list. 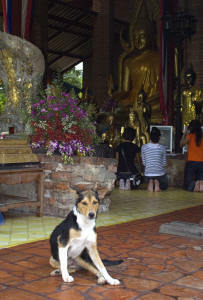 Today the city is a lively cross cultural town. 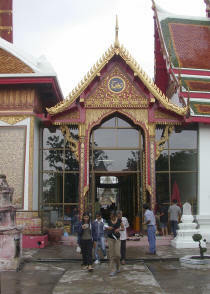 Our first stop outside the inner city was Wat Phanan Choeng. 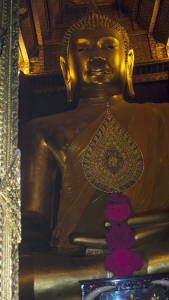 This working wat is visited by many pilgrims who purchase robes for offerings to the large gold Buddha (19 m high). 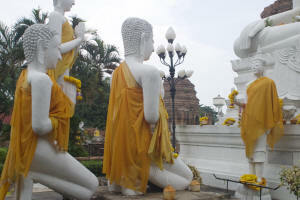 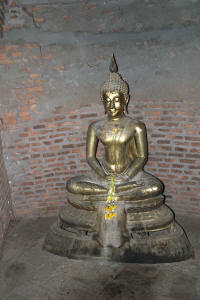 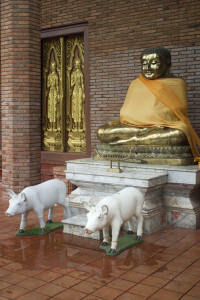 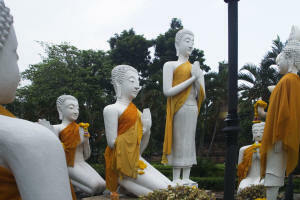 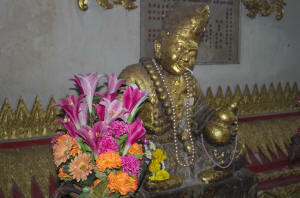 Surrounding the uboset are many other beautiful Buddha figures. 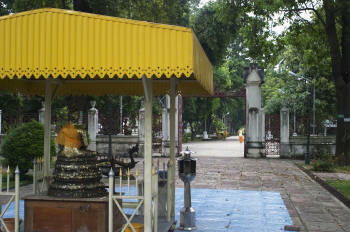 Our next stop was Wat Yai Chaiyamongkol (Chai Mongkhon) built to commemorate the victory won over the Burmese in 1592 by King Naresuan. 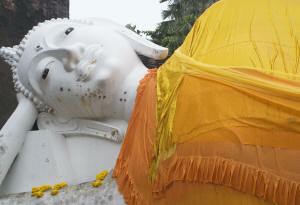 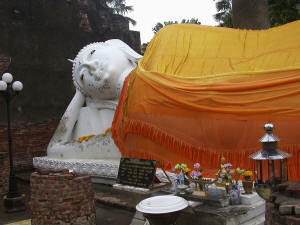 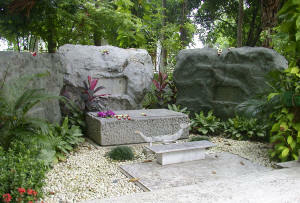 The huge reclining buddha is one of the few in this area. 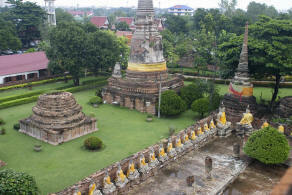 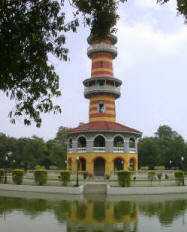 This chedi here is one of the largest in Ayutthaya. 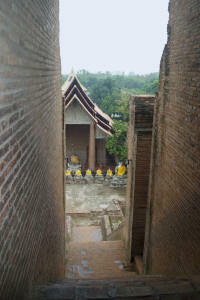 Views from inside and outside the chedi. 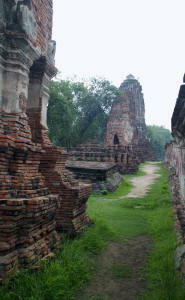 We stopped for a elephant ride among the ruins of Wat Phra Ram. 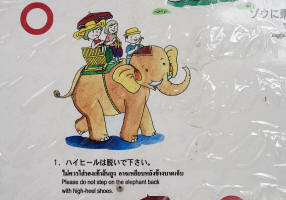 Signs warned us not to step on the elephant's back with high-heels. 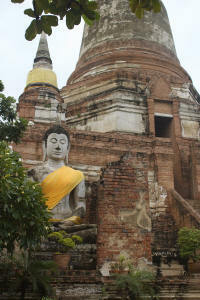 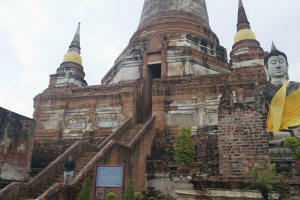 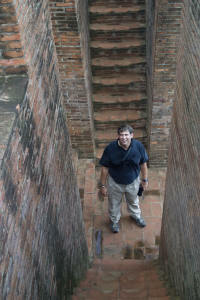 Our last stop was the Wat Mahathat built in the 14C and said to be the spiritual center of Ayutthaya. 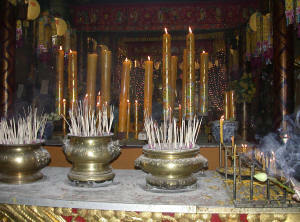 Its temple once house a holy relic of Buddha. 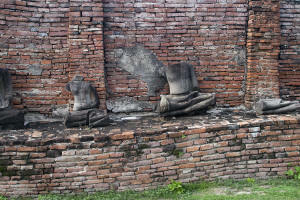 Many walls and chedis remain in place but the Buddha images have all had the heads removed by souvenir hunters of 30-40 years ago. 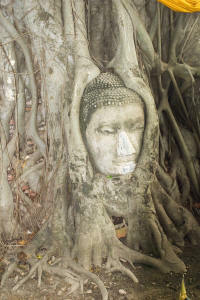 The 'Face of Buddha' is encased in a tree that continues to grow around it. 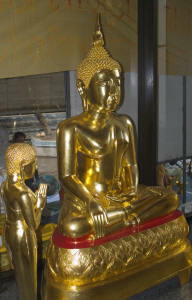 Our last night in Thailand is spent at the Airport Arman Hotel. 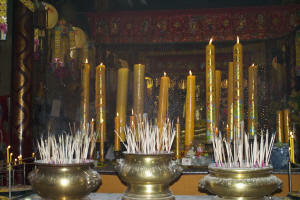 We have an early flight to Paro, Bhutan in the morning.